The Kunz 44" Rough Cut Mower is a great all around tow-behind capable of tackling heavy brush and tall grass, field or pasture mowing, food plots, or just as a trail cutter. 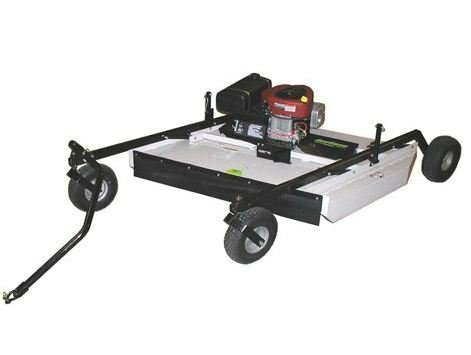 This heavy-duty brush cutter offers the highest horsepower and heaviest built decks on the market for pulling behind an ATV, UTV or garden tractor. 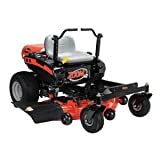 Class Mower: Rough Cut (Rear Discharge). 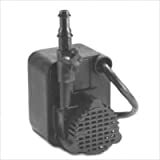 Engine Make: Briggs & Stratton.Engine Model: Intek OHV (Twin Cylinder). Engine HP: 23.0. Lubrication Method: Pressure with Filter. Electric Start: Yes (Battery Not Included). Number of Mower Blades: Two 30.0". Blade Tip Speed (ft/min): 19,000. Cutting Width: 44.0". Cutting Height (Infinite Adjust Each Wheel): 2.0" to 8.0" (By Two Cranks). ATV Tongue: Standard. Blade Engagement Clutch: Manual. Deck Metal Thickness: 10 Gauge. Deck Top Plate Thickness: Two Separate 1/4 in. Thick Plates. Weight: 550 lbs. Pneumatic Fixed Rear Tire:Yes (15/600x6 4-ply Tubeless with Precision Sealed Bearings).Pneumatic Front Tires on Casters:Yes (5.30/4.50x6 Tubeless with Precision Sealed Bearings). Fuel Tank Size: 3.75 Gallons. Blade Spindles: Greasable, 30mm Shaft Size, Bearing No.6206-2RST. Drive Method: 1 B Section "V" Belt. Warranty: 1 Year, Non-Commercial. Wetlands Kit: Includes an extra set of tires and mounting brackets ... easy to install. Great for wetlands or marshy areas that stay wet all year around. Works well in combination with small personal amphibious vehicles. Kit more than doubles the tire surface area in contact with the ground. Works on all existing and new rough cut mowers. The rough cut mower will not float with the wetlands kit installed. Water greater than 2.0 to 3.0" in depth should be avoided. With the Wetlands Kit installed, the minimum cutting height is 3.5" to 4.0".